If you're thinking about buying Pixel C, Google gives two good reasons to do so now: Android N beta program and developer discount on the hardware. The tablet normally sells for $499 (32GB) or $599 (64GB) but you could instead pay $375 or $449, respectively. Keyboard is another $149. The discount and beta OS are meant for developers, but anyone can get them. Pixel C is the best Android tablet I have ever tested, but that's acknowledging prejudice against Samsung tabs, which are worthy contenders, but I dislike TouchWiz UI. Sammy's hardware hums, particularly the stunning screens. But only Google serves up a Marshmallow feast in Android 6.0, and the hardware design and construction are preemo to the max. For less than $400, Pixel C might as well be free, there is so much value here. The bigger competitor in the size category, Apple's iPad Air 2, costs more: $499 with 16GB storage capacity. There are rumors of a successor, borrowing features from iPad Pro, being announced on March 21st. But that's not what you can buy today. However, if there is a smidgen of truth to Internet rumors, capabilities will be closer to Pixel C -- if not superior. The design is recognizably reminiscent of Chromebook Pixel. The screen, shape, styling all are derivative. The tablet even adorns the distinctive color bar and adopts USB C. Owners of Google's pricier PC will find no better companion. It's no coincidence the timing around Pixel C's initial launch, developer discount, and Android N beta. Alphabet, Google's parent company, is massively moving into the corporate, educational, and government segments with ferocious vigor. Consider Chromebook, which continues its successful sales push into the education market, bumping out OS X and Windows systems. Hehe, Apple CEO Tim Cook's alma mater, Robertsdale High School, is replacing student MacBook Pros with Lenovo N21 Chromebooks. 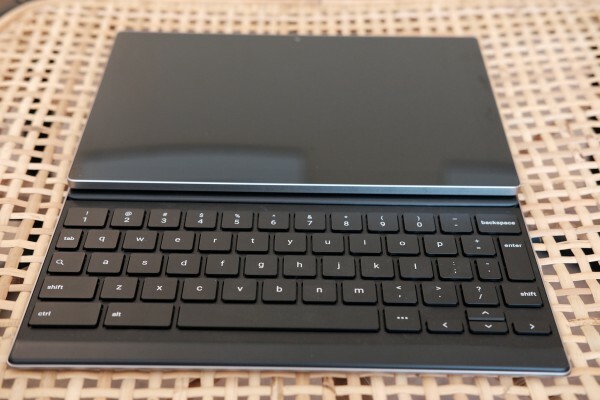 Pixel C can be tablet, or with attached keyboard, an Android PC -- potentially vying for some of the same buyers looking for alternatives to iOS, Linux, OS X, or Windows. Unlike Apple and Microsoft, which bet on larger tablets for office- and school-usage scenarios, Google goes 10 inches rather than 12 or 13. Is smaller bigger? For some customers it will be, but based on my testing not the majority. Given this context, the question every prospective buyer should ask: For what would you use Pixel C? As a tablet or something more? Apple and Samsung offer split-screen modes that extend functionality on their 10-inch-class and larger tabs. Google gives similar capability with Android N. The benefit, matched to multitasking functionality and keyboard, open up business-use scenarios -- as do the rapid-fire enhancements the company bangs into its cloud stack of apps and services. Much as I like Pixel, and its finger-friendly keyboard, I see limited business or educational use cases; for now. Caveat: Android N beta brings business-case finesse that looks to get lots more appealing as final release approaches. 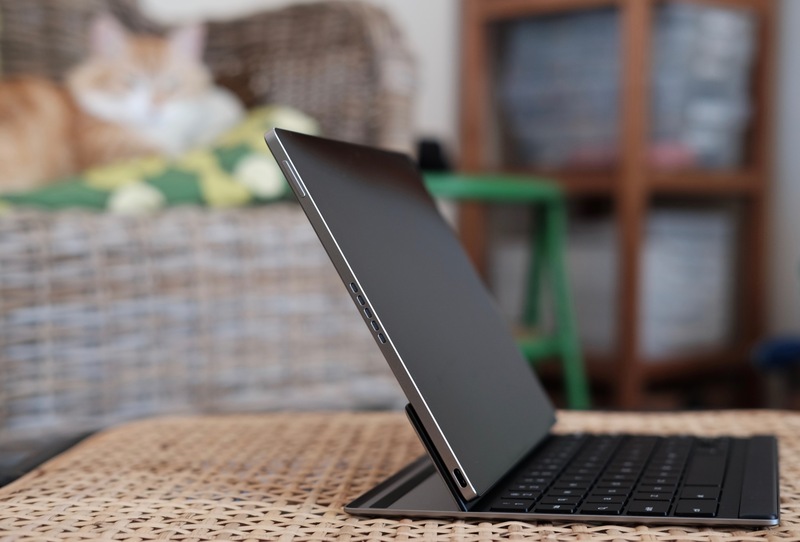 For now, Pixel C is more promise of laptop utility for many, but by no means all, potential users. The resolution is close to Chromebook Pixel, and a bit finer -- 2560 x 1800 compared to 2560 x 1700, respectively. Likewise, visual quality is similar between them. Many smartphone or tablet screens, particularly those AMOLED, present bold colors and rich contrast that looks good but isn't natural; they're not what the eyes see. Like the Chromebook, Pixel C presents more muted but pleasingly rich color and contrast that aren't over-saturated. Photographers, this tab could be for you. Web content pleasingly presents, as do Google's homegrown apps (and presumably soon those from third-parties). The aspect ratio is closer to Chromebook Pixel's 3:2 (another sign of the shared design legacy), which is superb for photography. Google Photos app presents fantastically with the √2 aspect ratio. 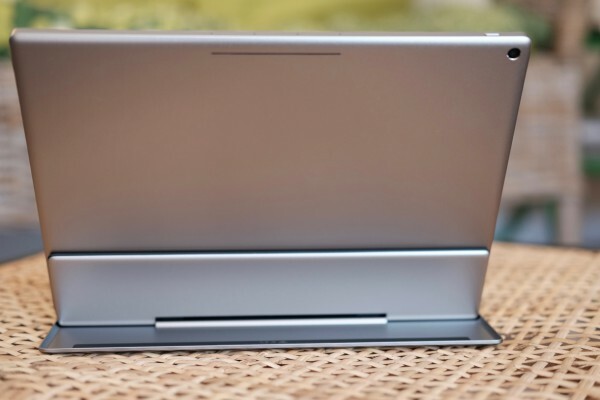 Pixel C could be a shooter's dream tablet, much more than any iPad other than the Pro. Audiovisual. Content consumption is fabulous -- that is for apps optimized for the screen size and aspect ratio, and there aren't enough of them. Google's discounted Pixel C developer program and early Android N beta release are essential to making the overall tablet experience more consistent and more immersive. That is, if app creators can get the schtick with platform-optimized apps. The √2 aspect ratio presents 16:9 or 16:10 video content pleasingly. The viewing window is plenty large. As for accompanying audio, Google places the speakers on Pixel C's bezel to each side rather than facing front. They give great soundstage and separation. The Android experience excels with respect to context, by providing information you need where and when you want it. iOS is deficient, by contrast, and the difference glares more brightly when using Android N's refined Notifications feature, for example. Handling. Pixel C feels heavy in the hand, but the heft isn't unbearable or even tiring when used as a tablet. iPad Air 2 weighs less than a pound (437 grams), while Pixel C climbs to 1.1 pounds (517 grams). The solid construction contributes to the sense of weightiness, which, to reiterate, isn't uncomfortable. Regardless the orientation, Pixel C holds well, particularly as a traditional tablet longways vertical. The physical benefit is balance. The aforementioned extra heft is easily ignored because Pixel C balances so well in the hand(s) whether held in landscape or portrait orientation -- and the squarish shape is major reason. Handling the tablet feels familiar, like holding a book, and handles much better than any iPad. How funny if Pixel C's killer application turns out to be the aspect ratio and physical shape. Pixel C isn't as good for general PC-like usage as it is an Android tablet. In many respects, the device is proof-of-concept for future tab hybrids -- as Alphabet broadens strategic ambitions, subsidiary Google refines the mobile OS for daily productivity usage, and applications are optimized for the platform. Keyboard. Google's extra-cost, $149 keyboard is surprisingly satisfying. The keys feel good, give great travel, and are responsive to the touch -- like I would expect from a device branded Pixel. They look fantastic too, adding to the tablet's classy appearance. I can type effortlessly and, coming from Chromebook Pixel, am not put off working in one app at time. While some users will want split-screen view or even separate windowed apps, I'm not convinced of the utility on a tablet this small. Apple, Microsoft, and Samsung are right to offer one or both capabilities on tabs with 12-inch or larger displays. However, Aluminum all-the-way-around makes the touch more cold feeling, and combined weight jumps by 399 grams to 916 grams (2.02 pounds). For comparison, the 12-inch MacBook weighs 920 grams (2.03 pounds). Point: This isn't a light kit, and some people will find it to be too heavy for the limited productivity utility compared to the Mac or other thin-and-light laptop. Other Controls. Whether or not used with a keyboard, the touchscreen is the major means of interaction. Responsiveness is excellent, as it should be for a tablet branded Pixel. But user experience is bigger than touch, bolstered by balance of hardware and software. The nVidia Tegra X1 processor, Maxwell graphics, and 3GB RAM matched with Marshmallow make this aluminum beauty one smooth operator. Touch wouldn't feel as fast otherwise, and the experience is consistent, whether apps are homegrown, third-party, or tuned for the display size. Buttons and ports are laid out for landscape orientation; placement may disorient some users' muscle memory. Held in portrait fashion, power button is upper-right side, volume controls on right-topside, USB C port top-left side, and audio jack lower-right bottom. Turned sideways: power left-topside; volume upper-left side; USB C lower-left side, audio upper-right side. Landscape placement is convenient, particularly for accessing volume buttons or for USB C charging. Webcam is top-front facing in this orientation, unlike iPad where iSight is left-side front. Meaning: Apple poorly places the webcam for video chats or Hangouts. Google gives better. The placement of controls and webcam is more like a laptop than a tablet, and fits better with using Pixel C with a keyboard. However, the tablet is also meant for the browser and some other apps in portrait mode, where the layout of buttons and ports is inconvenient. You design primarily for one orientation or the other. For Apple, it's portrait and for Google it's landscape. The difference illuminates design usage philosophies, and both companies compromise. On iPad Pro, which Apple intends to be used often in landscape mode as a laptop replacement, controls and webcam are placed like the smaller sibling tablets, which, to repeat, controls are laid out better for portrait use. Google's layout, while not as good for portrait use where web browsing (and with it all those ads Big G wants you to click), better suits both orientations than Apple's. For my tastes, Pixel C is the ideal Android tablet. Features finely balance, and the device balances beautifully in the hands. However, as a PC-like productivity alternative, the tab is too small and the range of necessary apps isn't big enough. That said, If I were a college student, Pixel C would be the near-perfect carryall. The keyboard pairing turns the tablet into a fantastic tool for taking notes, doing research, and completing homework. The apps are there, if from no other developer than Google. 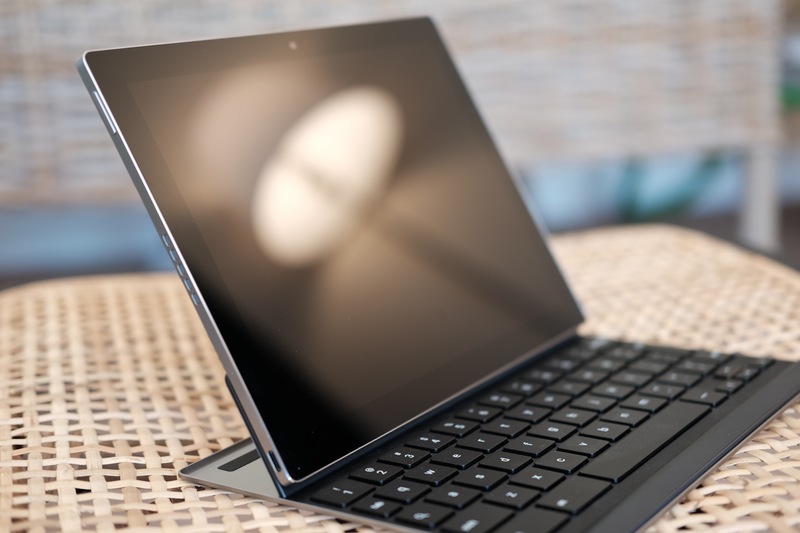 As important: The keyboard covered screen turns Pixel C into an easily and comfortably carried daily device. It's too bad there is no LTE model because many niche iPad Air 2 or Samsung Galaxy Pro users would benefit more from Pixel C and all the information and cloud services Google wraps around it. Among them: insurance agents, Lyft and Uber drivers, medical professionals, realtors, and other on-the-go contractors, small business owners, or sole-proprietors. That said, anyone buying Pixel C today as a tablet can expect better PC-like productivity utility at escalating pace. Take a look at Android for Work, the aforementioned shot-list of recent business customer enhancements, and Android N capabilities like always-on VPN. Like the Chromebook sharing the same name, Pixel C will get better as Alphabet/Google grinds out more productivity goodies for Android users.